For an avowed news junkie like me, it ought to be simple to write about the upcoming Presidential election, and to compare and contrast it with the recently announced Israeli elections, slated for Jan. 22. That's why I readily agreed when I was asked to submit this post. Saying "yes" was the easy part. Then I got stuck. You'd think there's plenty to say: After all, I've been following politics in the US and Israel since long before I was eligible to vote, and I'm never short on opinions. So what's the problem? For the past week, the screen on my laptop has remained blank. I stare, fingers poised at the keyboard, ready to bang out the pearls that I know must be seconds from materializing. But... nothing. But all the while, the election silliness keeps distracting me in both countries. Americans "de-friend" people who have different political views so they don't have to be upset each time they log on to Facebook; Israelis, on the other hand, cherish people whose views they abhor because they relish the opportunity to engage in online shout-fests. American voters have seen public discussion revolve around Big Bird, binders and bayonets, while Israelis obsess over the former TV host who wants to be prime minister and various politicians' boasts about the vote-getting power of their social networks. Today was the day that everything became interesting again, and suddenly the words began to appear on my computer screen. Six and a half minutes of a press conference in Jerusalem -- no time for questions! -- and you can't help but sit up and take notice. 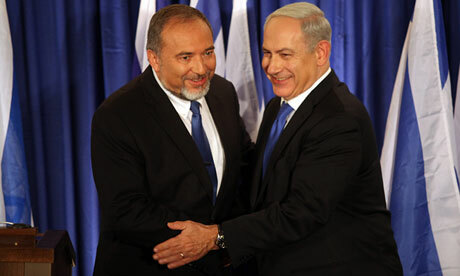 When Prime Minister Benjamin Netanyahu and his longtime frenemy Foreign Minister Avigdor Liberman announced that their parties -- Likud and Yisrael Beiteinu -- would run on a joint list in the January elections (and that they expected to win 50 seats in the 120-seat Knesset), even the most jaded observers had to perk up. The jury is still out as to how the Israeli electorate will respond to the move. It's not a foregone conclusion that Netanyahu's calculus was right - we won't know for sure until the ballots have been counted. But that didn't stop one commentator from announcing that Israel was moving toward a two-party system, and another from declaring that the move would lead to Israel's increased isolation. The apparent consolidation of two Israeli political parties doesn't change the general thrust of what many election watchers are thinking here and in Israel. The same thoughts will continue to go through our heads as we march toward the day when, finally, the ballots have been cast and the votes have been tallied. Which leads me to the great revelation that finally struck me in the aftermath of the "big" news from Jerusalem. Despite all the differences - in issues and perspectives, in disposition and temperament - there's one thing that clearly ties the Israeli public and the American public together as they wait for the polls to close and the votes to be counted: On both sides of the ocean, we all can agree that what we really want is for the elections to be over, so we can return to our normal lives.